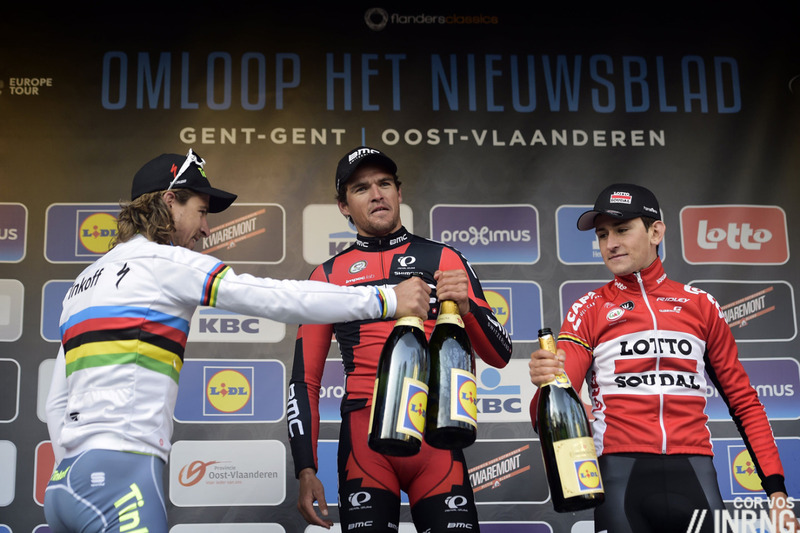 Greg Van Avermaet and Peter Sagan come first and second in the Omloop Het Nieuwsblad. It sounds so plausible, so probable as both have enjoyed an outstanding year. What a difference a season makes because rewind to February and both were in a losing streak and often made the headlines for the way they lost races rather than won them. One of the first signs something was different this year was Sky’s Luke Rowe attacking up the Taaienberg. Normally Tom Boonen always leads up this climb. Tommeke didn’t make it that Saturday and he’d spend most of the spring playing catch-up. Rowe went clear with Greg Van Avermaet and over the top of the climb Lotto-Soudal’s Tiesj Benoot and Peter Sagan joined them to form the winning move with 55km to go. 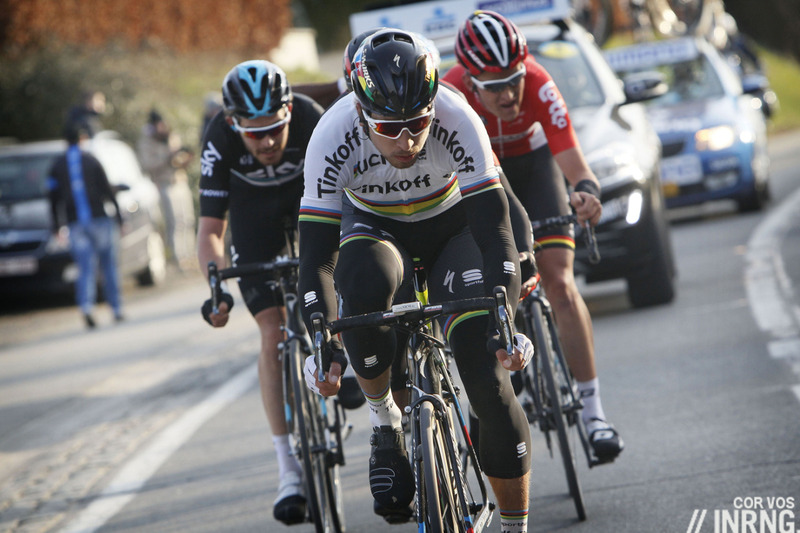 Etixx-Quickstep chased but Tony Martin slid out on a corner and Niki Terpstra rode into some spectators. This was six domestiques in search of a leader, they might have chased but if the race regrouped what chance they’d be outwitted by a late attack or beaten in the sprint? High and team manager Patrick Lefevere may have spent final moments of the race working on something provocative to say in order to distract attention from his riders. Ahead the quartet of Sagan, Van Avermaet, Benoot and Rowe caught the remnants of the day’s early breakaway and had briefly had four spectators sitting on their wheels. Over the crosswind-blasted Lange Munte cobbles the wheelsuckers were distanced but one, Ag2r La Mondiale’s Alexis Gougeard, found the strength to haul himself back onto their wheels and show us what kind of power he’s got. The bunch was chasing and this stopped the quintet from toying around: collaborate or lose. As they came into Gent their lead was hovering at 20 seconds. So who was going to win the sprint? Obviously not Gougeard but at time the other four riders had a good chance on paper. Rowe had won the bunch sprint the previous year ahead of Arnaud Démare and Alexander Kristoff. Tiesj Benoot looked very powerful that and the new slightly uphill finish might have suited him. Sagan has that sprint but remember this was happening during that long period when he was struggling for wins rather than the view you might have of him today. Van Avermaet could be very fast in a sprint too but was also a habitual placer rather than a winner. Van Avermaet confidently launched a long sprint which saw him get the jump on his rivals and they never got back on terms with him. 2020 Hindsight: usually hindsight is obvious but this time it feels odd, like glimpsing back to a different era. Peter Sagan and Greg Van Avermaet have both had their best ever seasons. Today Sagan seems effortless and carefree, epitomised by the way he seemed to float around France at will. But rewind to late February and he was still in that phase where he was struggling to win and some worried about the “curse of the rainbow jersey”. That superstition has flown out of the window but back then he making the headlines for losing rather than winning. A podium place here, fourth in the Strade Bianche, four top-4 places in the stages and second overall but not a win along the way in Tirreno-Adriatico and then outsprinted by Michał Kwiatkowski in the E3 Harelbeke. Even his trusty sprint was letting him down as we saw in the Omloop. 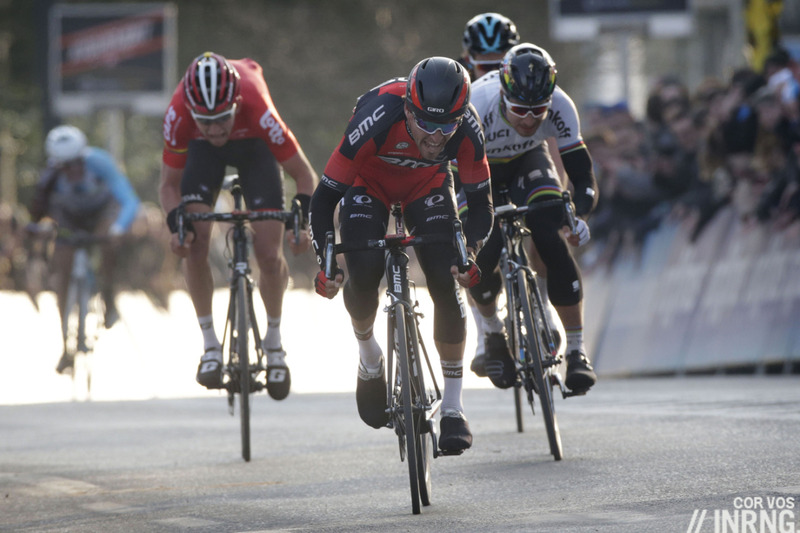 Greg Van Avermaet found winning ways here and what proved to be a useful result in February was just the start of a huge year. Who was the best cyclist of the year? Probably Peter Sagan but you could make a good case for “GVA” too with his success in the Tour de France and Olympics. He even won Tirreno-Adriatico because the mountain stage was cancelled because of snow. He showed that the “curse” of the Omloop didn’t exist either with a good spring and a fine year although he did crash out of the Tour of Flanders. For others it was a high point of their year. Rowe and Benoot are still tipped for a big result but after making the break in the Omloop they never came so close to a win again. Rowe was fifth in the Tour of Flanders and became road captain for Chris Froome in the Tour de France while Benoot crashed out of the Tour of Flanders and didn’t bank a grand tour in the legs. Gougeard too deserves credit, he was still 22 at the team. Loyal readers will know this blog was banging the drum for him before this race and with hindsight the Omloop might have show up some limits. He goes in the early breakaways because he doesn’t like scrapping for position so converting his raw power into something more refined is still a work in progress but the good news is that this can be fixed. Ag2r, home of long term contracts, have signed the beer-loving “Gougou” until 2018 and have a useful team for the classics with him, Stijn Vandenbergh and Oliver Naesen. Sensing the weakening chase Trek’s Jasper Stuyven tried a late chase but only ended crashing on a bend. A shame for him but he dusted himself off and won Kuurne-Brussels-Kuurne the next day thanks to another big solo effort late in the race. Why the highlight? Long range action with the winning move launched with 55km to go and the chase behind kept the suspense up. Better still this was a mouthwatering start to the spring classics season that only raised the excitement for what was to come. With hindsight it’s still a fine contest especially as it shows Sagan and Van Avermaet as rivals. 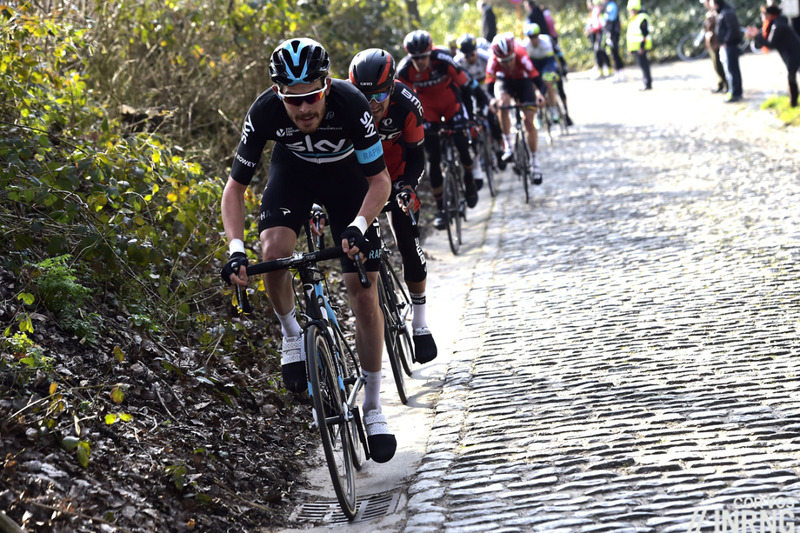 The ‘cobbled classics’ rarely fail to deliver. I think your highlights review could last another ten parts at least, Inner Ring, because there was lots of cracking races this past season with many of them in Spring. It was a toss up between this and Stuyven’s solo effort the following day for me – I might have said the latter, as he was ‘Belgian Hardman’ personified. But they were both great, socked it to Etixx too. There will only be five highlights but it’s always difficult selecting them, like all lists or collections you’re forced to leave out plenty of things. Stuyven’s ride the next day was impressive but it seemed more one-dimensional, a big attack and a solo push and that was that, obviously a huge effort to deny the sprinters. Good to recall the Spring Classics, memories of which have long been filed away behind the logs of the equally exciting–and dramatic–Grand Tours (Kruijswick wiping out in Stage 19 of the Giro, Froome running up Ventoux) and Olympics (Nibali and Henao sliding out near the end). Van Avermaet is no longer runner-up for inheriting the nomiker of “Eternal Second,” so that must be a relief for him. And he even wore the yellow jersey at the TdF, as well as winning Gold in Rio–both events unimaginable just two seasons ago! Let’s look forward to the upcoming season, and hope both GVA and Sagan stay safe and sound enough to give us some fantastic classics-style racing this spring. I would say this proves the curse of Omloop, rather than disproves it. My understanding is that the curse states if you win Omloop you wont win Flanders. And he didn’t. That’s true but it’s also been one of those “peak in February” and win nothing in March or April or even the rest of the year, although it wasn’t really superstition, more that the race was often won by a good rider but a great one. Now the race seems to attract the big names and this should continue with the World Tour status for next year, more big teams and more of them trying to win precious points. Maybe, but they were going so hard that it might not be blocking simply that Oss and the Sky rider were not able to move up the climb any faster. Great highlight. OHN is a wonderful curtain raiser and seldom disappoints. Long may that continue. Thanks for the review. 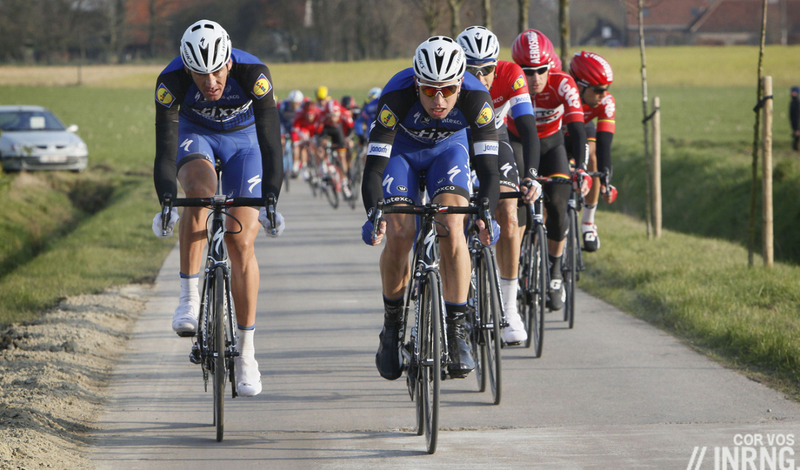 The Spring Classics have become my favorite part of the cycling season and this OHN was a very good edition. Will odd to see Stijn Vandenbergh in anything other than a Quick Step kit. Perhaps he will get a chance to lead and not get caught second-guessing his own team mates! I am really looking forward to see him in new colours. I hope he gets that long elusive win. Loved this, especially for its Gougeard component. Like you say he seems even stronger than results suggest, and still so young and mad. There was no way he could win but in that quintet supergroup it was him I was praying for, against hope. And so glad you mentioned Stuyven’s powerful attempt, followed by his win. I hope Trek’s new signings don’t eclipse this excellent talent. Usually it’s a very difficult question, comparing riders across races is always a subjective contest, eg comparing grand tour riders vs classics specialists vs sprinters. Surely Sagan would get the most votes this year though. Like many others, I also really liked the Stuyven win in Kuurne. One thing that makes it great to re-watch is the British announcers: they hardly seemed to notice his attack with 17km to go, didn’t even identify him correctly until about 14km, and then spent the next 10km saying how there was no way he’d stay away. That, plus his youth and previous day’s crash, made the whole thing seem extra heroic. My mouth is already watering for next year’s Classics season. There is nothing quite like the Spring races, one day I hope to spend the time in Belgium soaking up the atmosphere. My idea of heaven. Thank you for your 3-acting review of this year! I’v read it with great delight. Wish you all the best for the next year and hope to see your reviews again! Excellent description of the highlight….it wasn’t snowing and dark I would be motivated to go on a long right tonight!